It’s time to break out of your boring fitness routine and discover the possibility of a fun, high-energy and rewarding workout. CKO Kickboxing Simi Valley offers classes in Thousand Oaks, San Fernando and Moorpark that keep you coming back day after day wanting more. Discover why we’re different by joining thousands of REAL people, hitting REAL heavy bags to get REAL results. Get ready to reduce stress and burn calories with one of the best cardio exercises available. Kickboxing training is a form of high intensity interval training (HIIT) led by qualified and engaged instructors. We utilize a combination of both plyometric and calisthenic exercises to create the most exciting workout. These exercises encourage your muscles to exert maximum force for short intervals of time. The moves you’ll learn are rhythmic and packed into each workout. Our kickboxing classes are designed this way to not only build strength, but also to increase your overall muscle endurance. After just one class, you’ll understand why fitness kickboxing is such a hit! Traditional gyms require you to determine your own routine, which can be a real hassle – especially after a long day of work. CKO Kickboxing is different because our instructors develop unique workouts for every class. All you have to do is show up and relieve stress from the day. Kickboxing helps with weight loss as well as increased self-confidence. You’ll leave feeling healthy, strong and ready to take on whatever life throws your way. Don’t be scared off by misconceptions of fitness-based kickboxing classes. Beginners are welcomed with open arms at CKO Simi Valley. In fact, most of our members don’t have prior kickboxing experience. Before your first class, we’ll brief you on the techniques the instructors use and what to expect. Our gyms are not intimidating, so it’s easy to jump right in. Just come with tennis shoes, water and loose-fitting clothes and you’re ready to hit the bags. Enjoying a workout is possible. Our high energy kickboxing classes are proof. 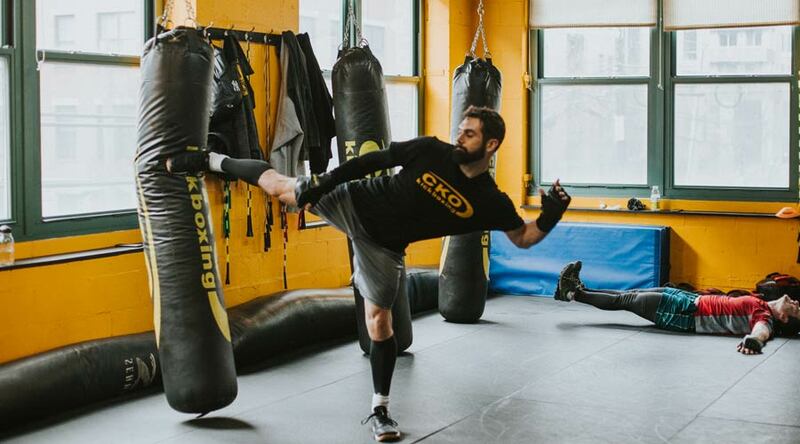 Try your first class for free to experience CKO kickboxing for yourself. Register now for your trial class.